A State of Mind: New Hope for Newcastle? 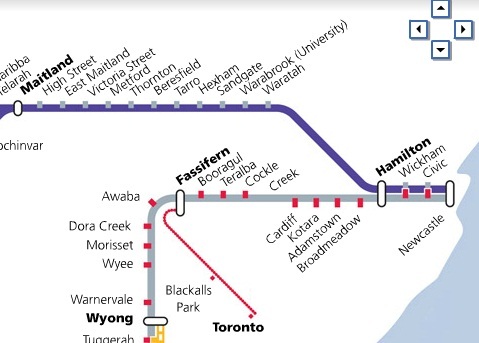 It's a little hard to immediately know what to make of O'Farrell's plans to remove from service part of the Newcastle train line. On one hand, for a government that has made all sorts of commitments to build infrastructure and, in particular, train lines, the decision would seem an odd one. The government is planning to spend billions and billions building the North-West Rail link just so that people don't have to get buses any more. You can see the rail line running along the Northern part of the CBD, just the other side of Hunter St. There has been a great deal of writing recently about Hunter St and the attempts to revitalise it. There is a great document here that speaks about the problems the street has at the moment and the plans to fix it. But they are both short-term solutions. 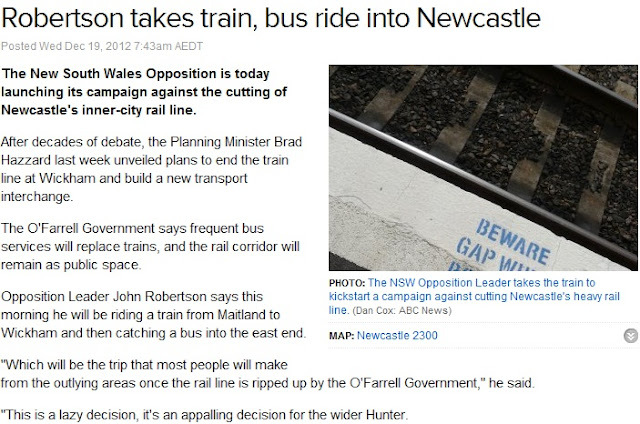 One of the biggest problems in the Newcastle CBD, in short, is that there is a great big bloody rail line in the way. True it is that Sydney copes with a great big massive train station in the middle of it. The difference is that in the main commercial section of Sydney the train lines are hidden underground - Central Station is actually a fair way outside the main commercial centre. Town Hall and the other City Circle stations deliver most people to their jobs in the CBD. 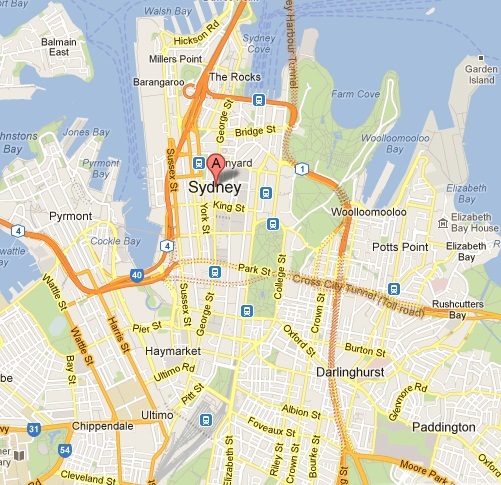 CBD is under the "A", Central Station bottom middle, blue squares all underground stations except for Circular Quay at the top. Moreover, Sydney has more room to move - as the map shows, the Newcastle CBD is in what must now seem like a pretty dumb spot, hemmed in by water as it is. The ideal solution would be to rebuild the line and the station underground - but I think it is safe to assume that the cost is well beyond what the government can possibly justify (or, for that matter, afford). In recent years multiple developments have been stymied because developers claimed that the train line was in the way. Presumably the idea is that the new crossings will greatly assist the flow of cars and pedestrians around the city. It may be the case that developers will now be able to build closer to the train line, opening up new opportunities. Naturally enough, Robertson has jumped all over the plan to rip up the line. Yesterday he caught a train from Maitland to Wickenham, and then a bus to Newcastle. Presumably his point was "How impossible is THIS? ", the fact that he was quite easily accomplishing the task being an unimportant detail. What he may have forgotten (or not realised?) is that Labor once had a plan to tear up the line. It had the enthusiastic support of Michael Costa, then Minister for the Hunter and the Independent Mayor of Newcastle John Tate. Unsurprisingly, the plan was shelved in 2006 by Morris Iemma after the predictable public outrage, notwithstanding independent reports that supported the change. It's obvious why the locals in Newcastle may not like the idea. If they are travelling into the CBD for work, this will lengthen their trip. I'll leave it for others to speculate as to whether it will actually have a positive effect on the Newcastle CBD itself. If it means that the area is opened up, traffic can move around more easily and new and exciting developments can go ahead, then it may be a good idea. The fact that the Coalition will be expecting to still win easily in 2015 also means that the project will likely not be cancelled due to short-term fears of imminent defeat. Whether they will be able to get the Novocastrians on board remains to be seen.